The Photo Palace: Our Kickstarter ! Hello all you die hard film fans, our Kickstarter is officially up! For those of you who don't know about Kickstarter, it is a fund raising web site for artists and innovators. 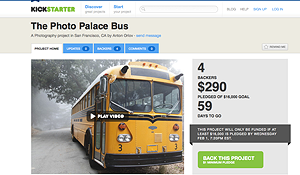 We are trying to raise money to convert Bus Gillig into The Photo Palace, check out our Kickstarter page to the right for more info. Photo Palace news, a letter from Anton. Outtakes reel from Kickstarter movie now out.